Reagan Gorbachev takes place in an alternate 1986 during the Cold War; both United States President Ronald Reagan and Soviet leader Mikhail Gorbachev have been kidnapped by extremists. They must work together, put aside their differences and save the world from a nuclear armageddon. The plot may be far-fetched and cheesy, but this game isn’t a lesson in political science. Developed by Team2Bit, Reagan Gorbachev is a cooperative game where both characters must escape every level alive. Standing in their path are guards, locked doors, traps, turrets and more waiting in the wings. Players can control each character separately or team up for 2-player couch co-op. Reagan Gorbachev is best played with another person, but more on that later. Reagan and Gorbachev feel the same when you are controlling them, but there are a few major differences. Reagan’s main weapon is a katana that slices enemies in one swing. Gorbachev is the master of lethal blowdarts and only needs one to take out an enemy. There’s also an array of handguns, shotguns, machine guns, bazookas and more that either character can wield. Reagan is also able to pick the locks of red doors while Gorbachev can use computers to hack open green doors. In addition to that players must cooperate to find keys, step on door opening panels and compete on the fastest time leaderboards for each level. Although some levels can be beaten in less than 20 seconds, its often easier said than done. That all sounds great on paper, but during my time playing Reagan Gorbachev I kept asking myself, “Am I having any fun doing this?” and more often than not my answer was, not really. The earlier levels teach you the basics and are pretty easy once you get the hang of things. After about a half-dozen levels the game becomes pretty difficult and it will test your patience. All it takes is one hit from an enemy and you have to start the level over; there are no checkpoints or extra lives. Playing solo is more challenging because you must control both characters individually and figure out the trial and error gameplay on your own. Having a co-op partner makes everything go faster and obviously makes levels easier with two heads thinking up strategies. There are tense moments where you finish a level with guards on your heels or you die right before the end which are exciting. But for the most part playing this game feels more like a chore than a joy. Reagan Gorbachev is a lot of things: silly, challenging, charming, frustrating and rewarding. The type of gamer you are will ultimately decide whether you enjoy it. 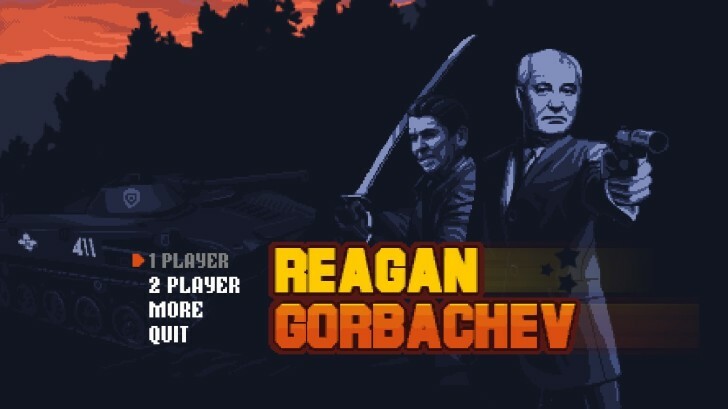 Ideally Regan Gorbachev is meant for patient and persistent gamers who have a buddy to play co-op with. Gamers who don’t mind dying a lot and stick with difficult levels might find this game right up their alley. I’m sticking with the game despite all the deaths mostly to see how the story plays out. If you are easily frustrated by trial and error gameplay and especially if you are playing on solo, you might find Regan Gorbachev to be more stressful than stellar.